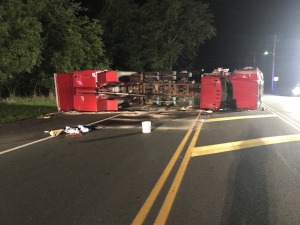 On Friday, September 8, 2017, at approximately 10:36 pm, officers from the Manchester Township Police Department responded to County Route 571 near the intersection of Ridgeway Boulevard in the Ridgeway Section of the Township for the report of an overturned dump truck. Upon arrival, officers located a 2014, Mack dump truck on its side blocking both directions of travel as well as a snapped utility pole and telephone wires down across the roadway. The initial investigation revealed that the dump truck, which was being operated by 52-year-old, Derrick Wiley of South Amboy, was traveling eastbound on Route 571 when the hydraulic arm on the truck’s dump bed activated, raising it in the air. As a result, the elevated dump bed struck telephone wires that was strung between two utility poles across the roadway. In doing so, the truck pulled the wires, causing an adjacent utility pole to snap and the wires to drop across the roadway. The impact with the wires also resulted in the driver losing control of the vehicle, which led to it rolling over in the roadway. Wiley was able to exit the dump truck with the assistance of several bystanders and was transported to Community Medical Center in Toms River for treatment of non-life threatening injuries. No other vehicles were involved in the crash. The crash is still under investigation as investigators are attempting to determine whether or not the hydraulic arm activation was a mechanical malfunction or a negligent action taken by the driver. Assisting on scene were members of the Ridgeway Volunteer Fire Department, EMTs from Quality Medical Transport, as well as representatives from the Ocean County Health Department and JCP&L. The roadway was closed for several hours in both directions while officers conducted the investigation and the roadway was cleaned up. The crash is currently under investigation by Ptl. Anderson of the department’s Traffic Safety Unit with the assistance of the New Jersey State Police Commercial Carrier/Safety Inspection Unit.